Giving birth to a baby as small as your hand is traumatic. Why in the world aren’t medical professionals acting like it? Why are preemie parents suffering in silence? There is nothing that can prepare a mother or father to see their child’s life hang in the balance before it even begins. Whether you see preterm birth coming or not, your heart completely breaks when you realize that you will deliver your child months before their due date. A third of preterm births have no known cause according to a recent study by the March of Dimes, therefore most mothers and fathers don’t even know what went wrong. But no matter the reason a baby is born premature, all parents of preemies end up in the same place, the Neonatal Intensive Care Unit, staring into incubators at babies too fragile to be in the world. Staining hospital floors with their tears. Hoping that their baby is stronger than they look. I barely remember my son’s birth. We went from rushing to the hospital because I was in excruciating pain, to laying down in a hospital bed with elevated feet. Then came the news that at 23 weeks, I would have to stay in that bed for my baby to live. No one really asked how my fiancé and I were doing, a psychologist never came in to check on me – all attention was on the unborn baby. I was at a complete loss of hope and words. Partly in denial, partly scared, partly numb. Within a few days it went from bed rest for twelve weeks to “Good Morning Mommy, we have to take the baby now”. At 24 weeks. 16 weeks early. I wasn’t prepared. Even laying there, I wasn’t prepared. After an emergency C-section Jharid Jr was born, one pound five ounces. He looked horrible. Small. Sick. I was bombarded with sadness, visitors, congratulations balloons and guilt. Fear. Uncertainty. One minute he was in my stomach and the next he was in a see through box hooked up to machines. A few days later his belly was black from necrotizing enterocolitis (NEC). It was so abnormal. While most mothers work to recover after a C-section I was up within a day at his side. At one week old he was transferred to a new hospital. There was no time to recover. He was fighting the stomach infection, grade three brain bleeds and weak lungs. His feeds were stopped. The grandparents worried about US, mom and dad, and surely our family and friends were concerned. But we were all far more worried about him. We didn’t matter. We just wanted our baby to live. A few days later I attended my post-delivery checkup. I was asked about my C-section, the baby, and possibly if I was stressed. I remember the doctor saying that my blood pressure was high. Of course it was, I had a baby born, dying. My gynecologist (a different doctor had delivered Jharid due to the emergency), never called at all. In the weeks to come, my mental health was never a topic of discussion. Thankfully, the love and support of our family and friends and the NICU nurses helped us to make it through. But we should have seen a professional. I now know that for those first few weeks I was in shock. I had never known such despair in my entire life. We had been through a TRAUMA. A Trauma that still to this day, six years later, has gone untreated. And in a survey of preemie parents on my site, 91 percent of respondents stated that no medical professional had talked to them about PTSD following their baby’s birth. How is that not mandatory? Is this not the perfect description of a preemie mom after the birth of her baby? We can’t avoid the NICU while our child is there, but after discharge we avoid going back. The smell of a hospital can send us into a panic. For years we still hear the beep of monitors. Many of us have severe anxiety. Months after the NICU, we live in fear of sickness, RSV, and even the death of our children. We watch them like hawks, jump at the sounds of a sneeze and are hesitant to leave them with others. Some of our actions are rooted in necessary caution, but much of it exists long after they are home and even longer after it is necessary. Oh and the triggers – baby showers, big pregnant bellies, and newborns! That is, if your child survives. If your child does not make it home, that is an entirely different trauma and still, often goes improperly treated. It is time for us to come to term with the fact that we are failing preemie parents by not paying attention to their mental health needs. Medical professionals, the change begins with you. If you encounter a mother who has given birth to a baby preterm, please inquire about her mental state and refer her to a doctor that can provide support. Speak with dad as well; they have to watch mom and baby go through the process of preterm childbirth. Screening for PTSD should become a mandatory component to the post-delivery checkup process and even the first visit to the pediatrician. Even before the mom leaves the NICU without her baby for the first time, she should be given information about PTSD. I started my organization, the Preemie Parents Club, to provide support to moms while in the NICU so that they wouldn’t have to suffer alone. Our meetings are therapeutic, to counter the triggers of PTSD. To prepare moms and dads for the journey to come. Preemie parents, we need to speak up about the silent suffering that we endure after preterm birth. It will empower others. It will give our suffering, a name. To those who care about preemies and their parents, please join the #ComingtoTerm Movement, calling for all of us to #CometoTerm with the fact that prematurity awareness and prevention must include the mental health of preemie parents. Email us at preemieparentsclub@gmail.com or share your story using the hashtag #ComingtoTerm. My name is Kaleena Berryman, and I am coming to term with the fact that after my son was born at 24 weeks, I suffered silently with PTSD. I made it to the other side. And you can to. It’s been an astounding six years, six days and twelve hours since I was welcomed into the preemie mom sorority, and I must say, it still feels like yesterday. Especially moments like the one I just had with my son, where he is smiling and full of happiness, a complete 360 from where we were this time last week. This time last week, he had a fever of 103, and we had made our third trip to the emergency room. Last week he was sick, but never once did he look as bad as he likely felt. Just like in the NICU, when his bowels, brain and lungs were all in turmoil. He rarely let me see him sweat. That preemie strength is a real thing. Six years later, it has stayed with him and been such a blessing to his Momma, who has walked on egg shells since the day he was born. Praying daily that no other disaster will happen, and thanking God daily for His grace and mercy that I am so much more aware of. I am a mother, like most mothers, when it comes to the way I love my child. We do what we think is best, and we would give anything for our children. Any mother who has a heart, can do this job. You don’t become different, until you are called. There is a life that mothers who almost lose their children live, and it involves another layer of love, and hope and appreciation and trauma. The simple reality of having a baby and not being able to take it home, forever changes you. It is exclusive, and strong. If you are a preemie mom, or the mom of a sick child, you know what I mean. It is the feeling that sometimes makes us uncomfortable around other moms, like we are keeping a secret from them that is only shared between us and God. If I could describe it, the secret would be knowing how truly vulnerable our children are, and therefore, how truly vulnerable we are. That the most important thing we can be at any moment, is thankful. For instance, there is an extra joy in good days. Less of a panic on bad ones. A calm in storms whenever they come and a high in triumph that most people rarely get to know. It comes from losing your peace of mind, and having it back again. It starts in the delivery room, when your baby boy is born at 24 weeks weighing one pound, five ounces. It grows in the NICU, when he learns to breathe on his own, takes a full bottle feed, or makes it out of a delicate surgery alive. It bursts, when he is discharged after five months and finally able to go home – it settles as you worry during the first cold and flu season, hoping to not have to see a hospital so soon. Some moments I look at Jharid and I feel this heavenly happiness. Other times, I feel crippling grief. Wondering even six years later what life without prematurity and cerebral palsy would be for him. That is another part that makes me different from other moms, feeling the guilt of the real role I played in the start of his life. It creeps up on me, like darkness, and throws me off my life. I find my way back to the me that is required to function, because if I stay there I would not be a good mom. Or a good anything, for it paralyzes hope. And then other, times, I sit next to his toddler bed and just, cry tears of joy that he made it through. Plus, he is so beautiful to me. He’s so beautiful to the world. The emotional roller coaster does not end with the NICU. And if your child’s challenges also follow them, the ride is never ending. Consider this, a love letter to preemie moms. A letter giving you permission to admit that you are different from other moms. Your entry into motherhood made it so. Yes, you truly do love harder and more cautiously. You appreciate the itty bitty little things. You cry more, and celebrate more and you never forget that your baby’s life began and almost ended. It doesn’t mean we are better, it just means that we exist. I am a preemie mom. I love, different. I am a holy hot mess. And I would not trade it for the world. I am a member of The Preemie Parents Club. I didn’t sign up for it – and like most preemie parents, I didn’t have any plans of ever joining. There were no membership forms, or recruitment events, or trial periods. One day, I was a typical mom-to-be, pregnant with my precious baby boy. The next day, I was giving birth to my son sixteen weeks early, who weighed in at one pound and five ounces. From there, we were in the NICU, a place I never knew existed. My baby was lying in an incubator connected a maze of tubes and wires, and it felt like my fault. He was a preemie. His dad and I were now, preemie parents. But more importantly, we were parents to the strongest most resilient human being we would ever know. We soon learned that although membership was not a choice there was however, an admission fee. It would cost as many prayers, and hopes. and dreams as we could spare. We spent five months in the intensive care unit of three different hospitals. We almost lost our baby, many times. We almost lost ourselves, a few times more than that. We became advocates and medical experts. Each day we grew more proud. Proud as our baby grew and beat so many odds. Grateful that despite his battle with necrotizing enterocolitis (NEC), grade 3 and 4 brain bleeds, retinopathy of prematurity (ROP) and lung disease, he was still fighting. Our membership had its perks. We knew our lives would never be the same. All across the world, millions of parents are a part of this club. Our journeys are different, our outcomes range, but the part of us that is forever changed, is the same. In my five years as a preemie mom, prematurity awareness advocate, preemie parent mentor and writer of poetry for preemie babies across the globe, there are some things I have come to know for sure. So, what does it mean to be a member of the Preemie Parents Club? It means that our babies were born early – they went from the safety of Mommy’s womb to the uncertainty of a NICU incubator. And it scared the heck out of us. It means that we had to leave our babies there. In the NICU. It means that we endured that unnatural separation every night, for days, weeks, months, and sometimes years, from our babies. And that stings. It means we felt a pain that parents of full term healthy babies, could never imagine. And we don’t want them to. It means that our babies almost met their life’s end at their life’s beginning. It means that we believe with all of our hearts, in miracles. It means that our babies were literally, born fighters. It means that we have seen more grace and mercy than we could ever truly thank God for. It means that we have felt tremendous loss, guilt and sadness. And its OK to say that without a “but”. Its OK to acknowledge the parts of the journey that scared us. It means that we learned early to be our babies’ advocate. We learned early to speak up, take notes, and talk to the team. And we will never unlearn that. It means that we are too, fighters. We have gone to battle with insurance companies who didn’t want to pay and jobs that didn’t want to give us the extra time needed to be with our babies. It’s a shame we have to fight so hard. It means, as we watched our babies grow, we GREW. It means that we will have to make some tough decisions. Each step closer to home will require us to make a choice. It means that our babies are born to us twice, once when they enter the world and once when they finally leave the NICU. It means that our journey with prematurity doesn’t end with discharge. It means that our babies may face challenges from their NICU stay; it means our baby may not even get the chance to go home. We know this from day one. It means that we are scared to have another baby. Scared to do it all over again. The thought terrifies us. The NICU took a toll on us. It means that our babies needs to be protected from germs for the first two years of their lives. We need you to understand that. And wash your hands. It means that our babies have two ages, actual and adjusted. We measure growth and progress differently. We don’t need you to compare. It means that we watch our babies sleep. We check to make sure they are breathing. We have to. It means that our homes will see far more therapists, social workers, nurses and doctors than we could possibly want. It means that number 20 doesn’t matter, because we are just so happy to have our baby home. It means that we are naturally more grateful and appreciative for the little things. Our babies were the little things. It means that we too, are survivors. It means that we need your presence, love, patience and respect as we adjust to our new membership. It means that our lives will never be the same. I am a proud member of the Preemie Parents Club. No, I did not plan on joining. And sometimes I wonder if given the power, would I have chosen not to belong? Prematurity gave my son, cerebral palsy. That is the hardest part. But it also gave me, him. He survived. And since I know the outcome of our journey as it is, I am smart enough to appreciate the blessings that prematurity has given us. I appreciate the NICU because it saved his life. The beauty in number one to 25. The lesson in it all. I am a member of the Preemie Parents Club. I know that it has made me a better person, and better Momma. My son, is a hero. If this is the journey that God had in the plans for us, then I will proudly, we will proudly, keep on, keeping on. November is National Prematurity Awareness Month, but I am always aware of prematurity. Every day, when I lift up my four year old son out of bed, and feel his warm love filled arms around my neck, I am reminded. At night, when he makes me lay in his arms, forehead to forehead, as he slips off to sleep, his beautiful lashes flickering across my face, I am reminded. In the evenings after work and school, when we practice sitting to stand and eating hand over hand, working on those fine mother skills, this Mommy, is reminded. My son’s premature birth is something I can never forget. The pictures of him just days old weighing only one pound covered in tiny translucent skin; the videos through his incubator, the hundreds of thousands of dollars in hospital bills from our hospital stay, are all reminders. The intense love I have for my miracle, and his daily challenges, remind me over and over again. My greatest gift came with my greatest pain. Prematurity has both broken my entire heart and burst it open with immense happiness. It has brought me a river of tears and a mountain of gratitude. At 24 weeks I gave birth to an extremely ill, small and sick son. I did everything right and my body had betrayed me. He spent five months in the NICU and battled retinopathy of prematurity, grade four brain bleeds, necrotizing enterocolitis and various other preemie problems. Still four years later he wears the scars of the leads across his little tummy. He is my survivor. I never imagined becoming a mother in the midst of such uncertainty, sadness and guilt. Every single preemie parent understands this. Whether our babies turn out perfectly healthy, face developmental delays, or pass away in the hospital, every single preemie parent is always aware. We are always aware of the reality of premature birth and its impact on families across the world. We have witnessed miracles in real life form. We have seen doctors and nurses save the smallest of the smallest. We have spent days, weeks, months and some of us years in the Neonatal Intensive Care Unit. We have begged relentlessly for a chance at life, and celebrated our baby’s chance at life, all in the same prayer. We have been angry; we have had some intense conversations with God. We’ve played the blame game. And we have persevered. National prematurity awareness month is not for us. Granted, it is a time when we can all share our journey; we have the permission to tell the stories of our preemie’s births that everyone may be tired of hearing. However, the power in this month comes from prevention, challenging the misconceptions, and empowering parents who are just beginning their journey. November 17th, World Prematurity Day, is an opportunity to shine a light on the leading cause of infant death, and the need to continue to study it, talk about it and heal from it. We can only fix what we can face. Just last month, the March of Dimes released a study that found that 2/3 of premature births in high incomes countries, including the United States, have no known cause. The key word is known. This means, that there is a lot more work to do. My Jharid is four, and because of prematurity he cannot yet walk and talk. He is loved beyond earthly comprehension, prayed for more than the dictionary has words and has a spirit of resilience that does not exist in a single adult I know. I birthed Praying4MyPreemie, an online source of inspiration for preemie families, and have written poems to celebrate miracles across the globe, because it has changed me so much. This work requires the NICU to stay etched in my mind, just as it remains etched in my heart. I am always aware of prematurity. But this month, I am asking the entire universe to pay attention too. Spread awareness, spread tolerance and send some love to a preemie family or NICU close to home. I promise you, if you do this, they will never forget. Because honestly, they have never forgotten. I will forever be a preemie mom. My preemie’s birth is always with me, even four years later. I still look at my son while he is sleeping, to make sure that he is breathing. My Facebook news feed is full of posts and blogs about prematurity and life after. When I am in conversations with expecting moms about their pregnancy, I can’t help but to encourage them to relax and enjoy the weeks ahead. I will never forget, that babies can be born too soon. I will never forget, that a uterus can betray you. My baby was born, too soon. My uterus, betrayed me. I can sum up my life in two parts, before prematurity and after. My son’s birth sixteen weeks early was the most defining moment in my life. It changed me. Delivering a baby who was only one pound, five ounces and sick – shook me to the core. My love for him was not premature or unhealthy. It was full term and strong. Those five months in the NICU were a hard way to start my journey into motherhood. Watching him fight, and praying he didn’t suffer, that was my life for the longest time. I thought once we were discharged that life would somehow return to normal. I thought prematurity and being a preemie mom ended with the NICU, and age adjustments ended in the first year. But then came surgeries and follow ups and procedures. I could never have been more wrong. My Son’s premature birth taught me some of the greatest life lessons. Appreciate the little things. Be patient. Pray and believe. Before Jharid was born at 24 weeks I saw these statements as popular mantras that people threw around. They are real, and full of power. In the NICU we found our sanity in celebrating the little things. For five months, that was all we had. The things that healthy babies do naturally, my baby had to work very hard to learn. Breathing, feeding, maintaining his temperature – all of those milestones took lots of time. We learned to be patient and to pray. Prayer was like breathing. His dad and I not only prayed for Jharid, we prayed for the other babies, and the nurses and doctors who cared for them. Sometimes, I would wake up from a nap in prayer. I prayed in my dreams. I prayed for my dreams. All of these things proved beneficial in helping us get through that part of our lives. I still apply them as I mother. Prematurity is still a part of our lives. Jharid suffered brain bleeds in the NICU and developed necrotizing entercolitis (NEC) and retinopathy of prematurity (ROP). The brain bleeds, lack of nutrients while recovering from NEC, and the visual impairments from ROP have resulted in real developmental delays. Jharid has cerebral palsy. So each day as we enter his school for children with special needs, and as we work on helping him learn to talk and walk, as we stretch his muscles and pray for his growth, I am reminded of how we got to this place. Prematurity is always on my mind. It is our reason why. Every year on his birth date I remember the day he was born. Jharid was supposed to be born in August. He was born in April. April. When it is time for his birthday to come around again, my mind is flooded with memories of his birth day. The labor that came out of nowhere. The fear and panic. The moment I let it settle in my mind that he wasn’t going to live. The moment he was born and we decided to fight like hell. I wrote the poem, On the Day You Were Born to put my sea of emotions into rhythm. His birthday is far more important to me, than my own. Any time I see a video or television show about prematurity, the flood of tears commences. Just last month I was watching an episode of Grey’s Anatomy and the episode explored prematurity. I cried for an entire hour. Even though the mother and father were actors, I didn’t want them to go through the NICU. I prayed the story would turn out positive. It didn’t. It is wonderful to see prematurity explored on television, and I wish talk shows and day time television would cover it more. It is the only way to remove the stigma and the shame. Prevention comes from awareness. I have a job to do. Before Jharid was born, I had never had a conversation about prematurity. As far as I knew, no one in the family was born early. I did not even consider it as an option and I did not know what a NICU was. As a result, when Jharid was born I had no one to call. There was no one to lean on. Part of my work now is to provide support to preemie moms through my Facebook page and blog, Praying4MyPreemie. I also write personalized preemie poems for parents, to celebrate the journey. They love my work, but for me it is therapy as well. When I write for them I am able to relive the miracles and the beauty of my son’s early birth. It helps me to keep holding on. Prematurity gave me purpose. It’s been four years and I still post about Jharid and call him my preemie. I still cry sometimes while looking into his eyes, grateful for how far he has come. As he stands in his gate trainer I still encourage him with an occasional “Preemie Power!”. Why? Because we may be out of the NICU but we are not out of the woods. We are still on the road to recovery. Prematurity has had a lasting effect on our family. Daily I am called on to console new moms and dads as they enter parenthood too soon. We are a family impacted by prematurity and we will continue to spread awareness. Without apology. Now I am still many other things – a partner, a mentor, a daughter and sister, a friend, a writer and business owner, but I am all of those things post prematurity. I will always and forever be a preemie mom. I will always and forever love and appreciate my miracle. At Praying4MyPreemie, I specialize in poetry written to celebrate the miracles that come with our children, through our personalized poetry service, Poetically Yours. Give me your story, sentiments, dedications, and I will create a beautiful poem to honor your child, at a reasonable price. There are no cards that tell our story, this poem will live on forever! First birthday – Coming home from the hospital – birth – even loss, I can capture the words of your heart. My poetry also makes a great gift! Email kaleenaberryman@gmail.com or call Kaleena at 9735176581 for more information. 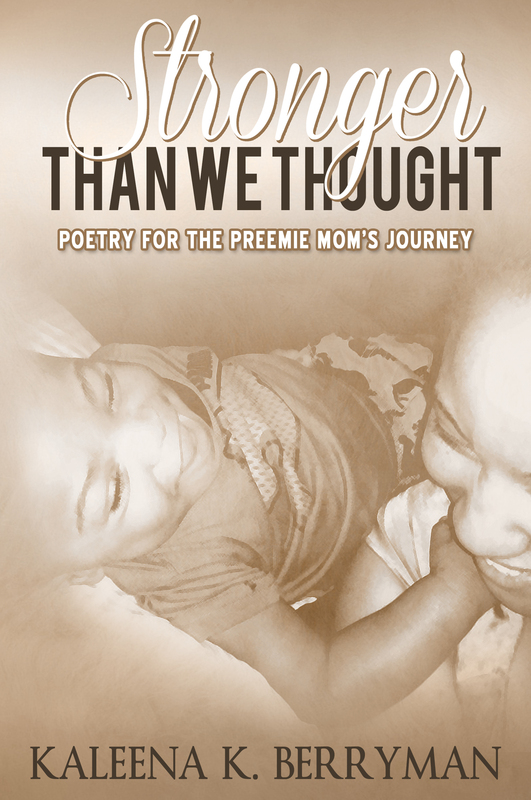 Download the Book of poetry: Stronger Than We Thought: Poetry for the Preemie Mom’s Journey. Download from Amazon onto any computer or electronic device!You do not need a kindle or nook to read electronically. This is my 7th New Year’s Eve as a preemie mom, and by far, the most exciting. I am ready. Life after the NICU has been a roller coaster, and now, seven years later, I feel as though I finally have my seat belt on. This Mommy is settling in and learning to enjoy the ride. My little rock star big boy has beaten the odds and I am super proud. Every day with him feels like New Year’s Eve and Christmas day all rolled into one. Giving birth to my son 16 weeks early in 2012 came with a lifetime of lessons, and those lessons have altered my perspective on my purpose and our journey together. .I can now sum up my 36 years on Earth in two parts – life before my son’s premature birth and life after. To have the worst day of your child’s life be the first day of your child’s life is an experience that touches every part of your being. You are forced to change. You have to evolve. Why? Because you have been given a miracle. Miracles once witnessed require us to become deeper, more aware human beings. BETTER PEOPLE. My son challenged me to find great value in the little things, for they are truly, the BIG THINGS. The wondrous everyday things we take for granted are the greatest gifts we have. There is nothing like peace of mind, waking up each day, and seeing your children smile. For this Mommy, there is little patience for pettiness and trivial worries. My life is all about love and faith. My 24 weeker is a reminder that each moment, milestone and ounce gained, must be savored and appreciated. Finally, I am no longer afraid of what is waiting for us around the next bend or at the next followup. Our days must be more than 24 hours of “what ifs”. So, for 2019 I have set a few goals. I call them my Preemielutions. 1. To be more present. The last few years have been a steady sea of medical terms, doctor appointments, meetings and worry. I will not let those things consume us anymore. Yes they will happen – my son has cerebral palsy and vision issues due to brain bleeds and retinopathy of prematurity – but they will not consume my mind. His milestones will not become more important than our memories. I vow in 2019 to enjoy my son more and spend more time just being his mom. I don’t want to miss the amazing part of NOW. He is not a diagnosis. He is a kid. 2. To stop comparing my son to other children. My son was born one pound five ounces at birth and fought like heck to be here. Yes, there are some war scars. In 2019 I will no longer watch other children and wonder when my baby will be able to sit up or play with friends or call my name. His journey is his own, and he deserves to be left to it. Those children did not breathe through a respirator, go without food for two months, or have three surgeries before they were three months old. He did. So honestly, there is no one to compare him to. My kids is in a league all his own. The Survivor League. 3. To dedicate time each day, for just US. He has school, we have work, and at the end of the day we meet. All three of us (dad, son and I) are tired. Some days we make time to play, and others he is asleep before we know it. School for a child with developmental delays is HARD. So, in 2019, I will make more time for us to “chill out”. In that play, he will learn. Every day, we will take a few moments and just be mom and son. I think we both need that. 4. To take better care of ME. I remember when we first brought Jharid home after his five month NICU stay, I never wanted to leave his side. Now, seven years later, this has changed. In the midst of it all, I have sacrificed the things I once enjoyed to be the “perfect mom”. I now understand that being the perfect mom means being the perfect me. That “perfect” moms do not exist. And more importantly, if I am not happy, healthy and energized then I can’t give completely to my family. So in 2019 there will be more shopping trips, nights out with friends and hair appointments. I matter, too. This Mommy is taking her life off of hold. 5. To get back to my NICU Prayer life. In the NICU, my prayers could move mountains. And they did. I developed a beautiful relationship with God and it helped me to make it through the saddest times. After Jharid was discharged and our immediate needs were met, I went back to being a part time prayer. I now realize that I still need the power of heartfelt prayer, now possibly more than ever. I think it is important to maintain that level of spirituality. I am cleaning out my prayer closet and giving God more of my time. We have quite a few more mountains to move. 6. To stop apologizing for the differences. No, I am not sorry. I am no longer apologizing for needing time off, for leaving work early, or for not making the birthday party. My son is special needs, and has been his entire life. We are different. And if anyone can’t get with the program, then they can get going. In 2019, I will no longer apologize for being a good mom. I will no longer apologize for not making my son do the things his body and mind can’t handle. He is not a mistake, so there is nothing to be sorry for. When I gave birth I made a commitment to HIM that I plan to keep. Nothing is more important. 7. To continue to spread awareness and share our journey. Write more. Speak more. See the World. I know that every time I write about the experiences preemie families share, a preemie parent becomes more empowered. Family and friends of those in the NICU gain a more realistic perspective. In 2019 I will continue to spread awareness and write the things that need to be read. My hope is that awareness will lead to less premature births, less mothers feeling stigmatized when it does happen, and more babies making it out of the NICU. Each of us can take part in that, by not keeping prematurity inside. I encourage all of you to raise your voices. Let 2018 be the year of Preemie Parent Power. Let it be resolved. 8. To say THANK YOU. For family, friends, and all of those who help us each day I am grateful. Thank you to grandparents who love our son with all of their hearts. Thank you to those who help care for him. Thank you to family for the presents that lessen our financial burden. Thank you to therapists and teachers who work hard with him Thank you to our bosses who work with us and our demanding schedule. Thank you to friends for visits and coffee and celebrations. Thank you to the moms and dads who have allowed me to put their preemie’s journey to poetry. Thank you to God for EVERYTHING. And thank you to everyone reading this, for spending some time with this mom and her preemie. We appreciate you. I hope you find something to hold on to in 2019. I pray you are blessed. And, I would love to hear your Preemielutions. From my family to yours, HAPPY NEW YEAR. We couldn’t have grown without you. On the day of our child’s delivery, as our world came crashing down, it seemed to be all about the baby and I. There was so much fear, heartache, anticipation and confusion, and to the world it looked like I was carrying it all. There is some truth to that – the baby was inside of my body and in sudden, real distress. We were nowhere near his due date. There was no more time to wait. It was my responsibility to keep our child inside, and my feelings of failure and sadness could fill the room. Everyone was worried for me, for us, and most of all, for the baby. The baby who was under two pounds and might not live through the night. The baby that we were all so excited for. The baby that would be your first born son and the sweetest gift I could ever give to you. I was scared that you were disappointed. It felt like the unluckiest day of my life. But you, my love, did not show even a bit of frustration. You held my hand and listened intently to the doctor as he explained the C-section and the reason it had to happen now. In your eyes all I saw was love and concern, intense and limitless. Yes, I was terrified for the baby, but you were terrified for the both of us. In the midst of so much uncertainty, I can still remember how solid you were. You were strong enough for the both of us. I don’t know if you noticed, but I looked to you to see if I could sense some shame or regret. There was none. In fact, you even seemed amazed by me. We were both holding it together and taking it in, ready to face this remarkable challenge with our son. Ready to fight. All you wanted to do was be there for me and our baby. You wanted to know the odds. You live on odds. And as long as the doctor said there was a chance for everything to turn out OK, you were betting on us. You gave me the courage to believe. When they wheeled me into the delivery room, you stayed right there. You caressed my face and wiped every tear away. Baby, you cheered me on. And when our baby silently came into the world, you saw him before I did. I would not have had it any other way. I was satisfied with the fact that, even if our baby didn’t live another minute, he would know his father’s love. He would have sensed his father’s gaze and felt the gleam of pride in your eyes. He had known my heartbeat for 24 weeks and now, he had become yours. When the doctors rushed the baby out of the room, you turned your attention to me. You did not skip a beat. Immediately, you became a father to one pound, five ounces of son. And that was all that mattered. I know you were terrified too. I know your heart was broken. I could not control the tears, so you had to. But I know you cried. I know you went into a quiet place and prayed. I am so glad you did. The prayers of a faithful father, availed. In the hours after our preemie’s birth, all of the questions were for me. The doctors and nurses checked on me constantly. Our family and friends were excited to see the baby and wish him well. You, were third on the list. But not to me. I watched in awe as you made sure I was taken care of and took visitors to see our son. I was honored to feel your protection. I relied on your reports to tell me how our little, little one was doing. Each one was optimistic. Each one was just what I needed to hear. And looking back on our NICU journey, it is true, you never showed an ounce of doubt. You appreciated all I did for him daily, the endless pumping of milk and the relationship I built with the nurses and doctors. The way I mothered our son completely despite the tremendous amount of anxiety I now carried. You were the one who told me to have the baby shower, to buy the clothes, to step out completely on faith. You were so much more confident than I. And each and every day you sat at our baby’s incubator, you gave him the strength to grow. He got that from you. You made it clear to everyone that THIS little boy, was coming home. You, my dear, never wavered. You gave me permission to trust. Thankfully, we have a life after the NICU. You are all of the dad I hoped you would be, plus more. You give so much of yourself to our son, and he admires you greatly. When you enter the room, his face lights up. His eyes follow your every move. He sees you the way I see you. As the man who made it possible for us to keep going, inch my inch, ounce by ounce. Neither of us, could have made it through the NICU, without you. You were our life support. You are the quintessential every woman. Day in and day out, you clear the way and make it possible for miracles to happen. If there were an award for “Mom Who Shines Brighter than the Sun”, you would win it, hands down. The world sees you, juggling your life and the life of your child, making it look so meaningful and effortless. Special, even. Those who have the privilege of watching you mother, believe that you were chosen for this “assignment”, and wonder how you are able to keep a smile on your face and a laugh in your heart. You meet each day with a child who isn’t like all of the others, who isn’t like theirs, and yet you haven’t seemed to fall apart over it yet. Your family and friends often say, “I have no idea how you manage to handle it all so perfectly”. Well, the fact of the matter is, you don’t. That would defy the law of gravity. There is no special strain of DNA that enables you to give the extra care your child demands. You were not born with supernatural strength or a heart of steel or faith that never waivers. What enables you to give so much to you child is LOVE. Good old fashioned, uncomplicated, straight from the womb to the center of your world – LOVE. The same love that drives every mother. The only difference is that your love has more requirements. You have to carry your baby longer because they haven’t yet learned to walk; there are countless doctor appointments that must be made and endless meetings that must be had. You must be more patient, more flexible, more forgiving. More hopeful. Your ER visits may be frequent and your child’s development delayed, so you make it through. You adjust. You take it all in what looks like stride. Because you love. Your child’s happiness is your mission. You seem like a perfect mother, because you work so much harder than other mothers. But the world doesn’t see the other side. The world doesn’t get to see the imperfect side of you. The way you fall apart in the still of the night when you think about the uncertainty of your child’s future after a new diagnosis. You wonder, when the next miracle will come, that one step closer to “normal”? The questions haunt you. Will my baby ever marry? Have children? Turn in a paper late to their professor or need my help practicing for the school play? More often than not, you are tired, and overwhelmed and heartbroken.You are human. Life, now means constantly struggling to find balance. Cuddling up with a good book and cup of tea in your room or an extra hour of speech therapy? A weekend getaway with your love or a weekend of doing everything? A day off of work to catch up on things or a day of doctor appointments? You sacrifice the quiet moments more often than not because you hold the same dreams for your child as the parents of kids with regular needs. But to have any chance at seeing them come true, your child has to work harder. So you work harder. You have no other choice. At your 9 to 5, you are amazing at your job. No one can tell that your heart and mind are often somewhere far away, wherever your child may be. You are forever the new mom just returning to work, dealing with the sadness that you are more needed somewhere else. And who really are you, now? You sometimes wonder if your husband thinks you’ve lost “it”. And maybe you have. Because your free time is never really yours, so there is no time to find “it”. “It” is a lot of work and doesn’t seem very important anymore. Your child trumps “it” every time. And then there are those dreams of yours, the plans you had for your life before you became a mom. You feel so guilty about wanting those things now. Partly because chasing dreams means sacrificing time with your child, and partly because it is hard to wish for the kind of success your child may not have the chance to attain. You sometimes tell yourself that you no longer matter. That God assigned you to be the mother of a child with special needs so you could put aside your own. You often get beyond those kind of thoughts, you know better – but the struggle is real. The struggle is OURS. See, these are the things I know because I am one of you. And honestly, these are the things that make me proud to be member of the “Special Needs Mom Club”; the things that set us apart from the rest of the world. Our truth. Selfishly loving our children unselfishly. The world is right to be amazed by us. We do ROCK. We give everything even when there is barely anything left to give. And we are in it for the long haul. Dear Perfectly Imperfect Special Needs Mom, be proud of the weight on your shoulders. It has made you strong. It has kept you humble. The proof of it is in the gratitude you find, in the smile of the child who calls your name, without ever saying a word. The child that you will forever, and in every moment, pray for.